VHDX provides support for virtual hard disks larger than 2TB, and up to 64TB; whereas VHD has a limitation of 2TB for the physical machine's hard disk. VHDX supports UEFI versus the BIOS boot method (meaning if the physical machine was using UEFI then you will need VHDX format to make the Virtual Machine be able to boot up in Hyper-V Manager). VHD only supports BIOS (also called "Legacy") boot method. Most modern computers utilize UEFI nowadays. If your physical machine that you are converting from Physical to Virtual (P2V) is using UEFI boot method, instead of BIOS "Legacy" boot method, then only VHDX will work for creating a Virtual Machine from a Virtual Hard Disk. VHD will probably fail to boot up if your physical machine that you are imaging to VHD was using UEFI as the boot method. Read more about UEFI vs BIOS boot mode here. 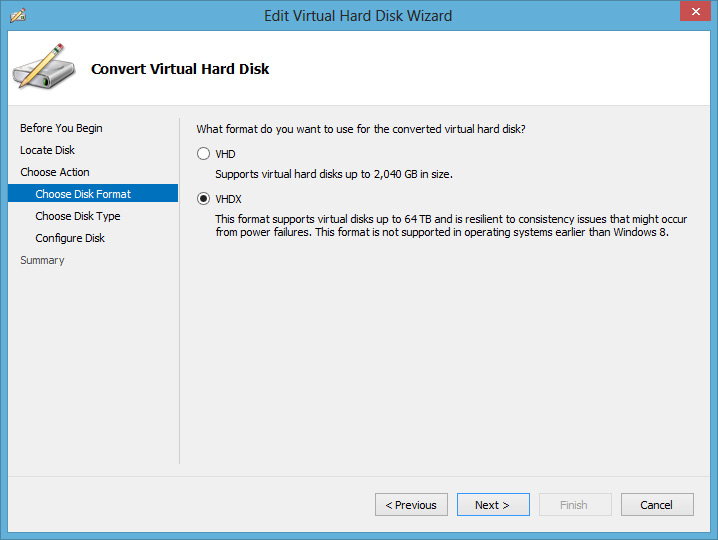 Luckily there is a simple way to convert VHD to VHDX and that is built in to the Hyper-V Manager application. Better performance of dynamic and difference files through new larger block sizes. Improved alignment of the virtual hard disk on large sector disks. Microsoft has a guide to read on this subject: Deciding On When To Use VHDX or VHD files with Hyper-V. Launch Hyper-V Manager and from the right-side Action pane and select Edit Disk. The Edit Virtual Hard Disk Wizard starts; click Next to get past the initial screen. Figure 1. Enter the name and location of the existing VHD file (see Fig. 1) and click Next. Select Convert and click Next. Select the VHDX file format and click Next (see Fig. 2). Complete the wizard by selecting the settings you need. Figure 2. Select VHDX file format and click Next. This process makes an exact copy of your existing VHD file, except now it's in the new VHDX format. And should the need arise, you can always use the same process to convert from VHDX back to VHD. We have a video walk-through here on how to convert VHD to VHDX using Hyper-V Manager's Convert function; the link for this video is fast-forwarded (starting at the 2 minute 41 second mark) to the section of a larger complete how-to video to perform the Image Backup to VHD using NovaBACKUP, then take the completed VHD and convert it to VHDX (this section of the video ends at the 4 minute 51 second mark), and finally how to create a new Virtual Machine in Microsoft Hyper-V Manager on your Hyper-V Hypervisor Server, to then attach the VHD or VHDX virtual hard disk file to that new Hyper-V Virtual Machine. Now you can take that converted VHDX file and Import it in to Hyper-V Manager to be able to utilize it. 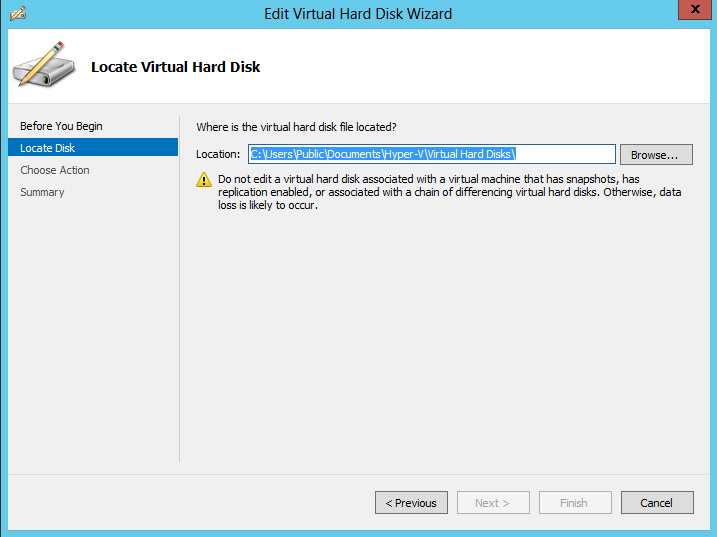 Next you will want to read the guide How to Attach an Existing Virtual Hard Disk (VHD/X) in Hyper-V. We also have a video walk-through guide available on YouTube here. View all NovaBACKUP related P2V articles here.